"Models sold outside of North America are not influenced by this issue." Just as Samsung was mopping up the embarrassing recall of the Galaxy Note 7, it appears another of its products is having explosive defects. This time, it's the company's line of washing machines. 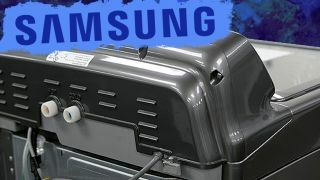 Though an exact model wasn't given, the US Consumer Product Safety Commission (CPSC) issued a safety warning today against Samsung-made washing machines made between March 2011 and April 2016, CNN Money reports. This is the same agency responsible for the Note 7's recall in the States. The CPSC's washing machine warning comes in response to a class-action suit against Samsung, where owners of its washing machines across the US states of Texas, Georgia, and Indiana reported violent blasts from their laundry rooms. One such owner claimed that the force of the busted appliance was "with such ferocity that it penetrated the interior wall of her garage." Samsung issued an official response, asking affected owners to use lower-speed or delicate cycles when washing bedding, bulky items, or water-resistant materials until a solution is reached, as it reduces the "abnormal vibrations" that seemingly cause the issue. The company also specified that only some top-load washers made before April 18, 2016 are affected, so anyone rocking a front-loaded machine should be fine. Those still left unsure can input their machine's serial number on Samsung's webpage to determine if they're in the clear, or should hit the deck come laundry day.